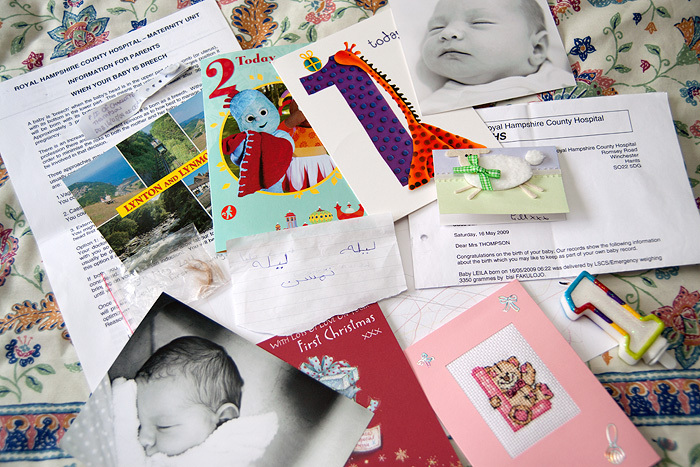 Having a little tidy up this morning and I uncovered some more precious bits and bobs to put in Leila’s box of memories. I unashamedly hoard for this collection of papers, objects, cards and photos that make up the parts of Leila’s life she’ll never remember. Mr. L has to keep me in check a little. I want to preserve ever memory we ever make together but let’s be honest, I don’t think they make boxes big enough. From photos of her first day at home, a postcard from our first family holiday, her first lock of hair and even her name translated into Arabic by a friend who was delighted we’d kept the original spelling…. everything is here for her to look back on when she is big and has babies of her own. I’m posting this here because I’ve noticed that the collecting has ground to a halt and I want to remember that even only 2 years on, these precious snippets of her life are moments I’ll never re-live. When she’s five, I’ll want to remember her as she is now too. Live in the moment, live in the past and live in the future… where my girl is concerned, I want to absorb every last second. Do you collect memories like this? Oh that’s so precious! My mum has kept all sorts of bits and pieces from my brother & I as babies… I had a bit of a peek once and found drawings, cards, letters from family friends who are gone now and the oddest thing? My ‘dordie’ (dummy).. covered in dog hair. Apparently I used to poke anything with hair with my dummy before using it. I’m glad I don’t remember that! You can never keep too much, when we thought we were moving I spent a lovely afternoon going through my horde of stuff saved for the kids, it was so lovely! I found a very precious letter from Tom, once when he was 7 or 8 he gave me a huge hug and a kiss and I said I wonder when you will be too old to kiss your mum, he said “I never will be” and I replied I’d like that in writing! Ten minutes later he very solemnly presented me with a bit of paper on which he had written “I will never be too old to kiss my mummy” with a lovely picture, one of the most precious things I own! He is now 17 and beardy and I still get a kiss btw!! i’m 16 and my parents kept loooaaaddds of my childhood/baby things and its amazing to look back at them! She’ll definately appreciate them in many years to come, keep as much as you can! Mum has lots of photos of us, plus some old clothes and toys she couldn’t ever bear to throw away, including a creepy fox with its hands sewn together that is older than I am! I never liked that toy, but apparently it was a gift for me before I was born from a family friend. Hm’mh. But the photos are really treasured – due to my disability, someone came to see me at school each week, and so a “diary” was kept by my mum for this assistant (to show I was getting a rich life I suppose? Nothing wrong with my limbs btw – it’s a sensory impairment). So there are tons of Polaroids in scrapbooks with descriptions under them – “Daddy playing on his new phone” (one Christmas!) – particularly precious to us as my dad passed away when I was 8 years old. Having the photos and descriptions are really evocative for us. “Aunty so-and-so with her son – my girls didn’t like him!” (oh dear! actual description! ), “Gordita at the park – she was scared of the geese!”, etc! The scrapbooks are heavily battered now, so we’re going to buy photo albums and transfer the photos and descriptions over. Your daughter will love what you are doing for her! I think it is so important to keep things like this. I still have boxes of birthday cards from my baby and toddler years and a scrapbook with the letters my nanny wrote to me when I was young. I also have the first proper pair of shoes and proper dress I was ever bought as a baby. It’s easy to keep too much stuff but too much is better than none at all – deffo! Do you do any kind of scrapbooking? I think it’s a nice way to hang onto these things while organizing it into a book. I save everything from my daughter (she’ll be 2 on the 20th). Every picture, video, card, everything. I have a few boxes and photo albums full of gig tickets, train tickets, festival wrist bands, cinema tickets and various other tat. I’ve even got a uniform shirt from my last full time job before ill health struck. I see things like this as memory aid because I’m pretty forgetful. If I’ve had a particularly good holiday I do a scrapbook of it with photos, receipts, tickets etc etc. My parents had boxes like this for me and my brothers. I say HAD as they quickly turned into many many boxes..my dad thought my mum was mad at the time but now he’s glad she kept these things.. I do this but for myself, keep receipts from memorable meals or purchases, my collection is getting out of control. I wish my parents had kept more from my early childhood though, they didn’t even finish the baby book! My little boy is 3 months and I also try to keep as much as possible for him to look at when he is older. Postcards, documents,his little wristband from the hospital,… I keep it all, a. My parents did the same for my sister and me, and I love still having these little reminders of when I was little. My parents did this for me and I am so grateful of it today. Helps give insight into a time that I don’t remember. I will definitely be doing it for my children!